After the opening day (see morning and afternoon posts) and the reception under the dinosaur at the museum, the second day started with an introduction and review of day 1 by Marisa Ponti (University of Gothenburg, Sweden): We want to reconnect to the first day. Particularly happy to hear the connection at the European Commission (EC) level about the link of citizen science and open science. Indicators for success, and digital and other aspects of inequality were address. Today we have 3 keynotes, and that is followed by two four parallel sessions. 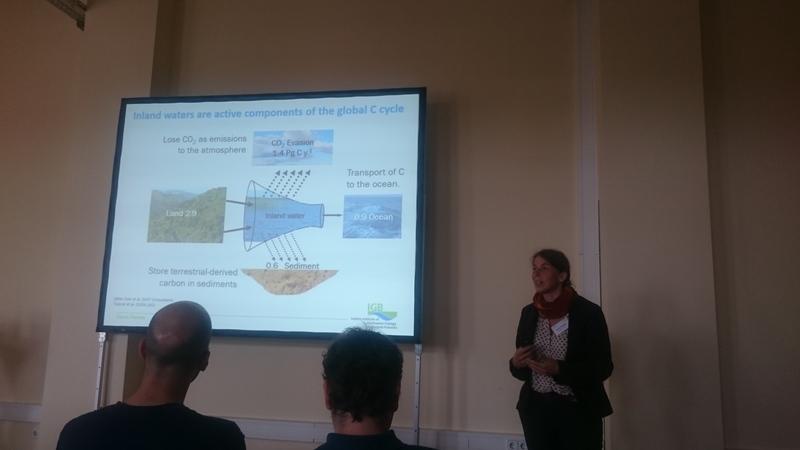 The keynotes were facilitated by Susanne Hecker (UFZ | iDiv, Germany) – we have several celebrations – including the birthday of the conference chair, and the success of conference with many participants. Citizen science – innovation & inspiration for science, Rick Bonney (Cornell Lab of Ornithology (CLO), USA), Rick has been working in the Cornell Lab of Ornithology for 42 years, and he started many citizen science projects in the lab. The end outcome for his work are projects like eBird which receives 18,000 checklists a day – eBird can provide specific location and see what was happening and you can report opportunistic or systematic effort. You can report what you’ve seen – the list is automatically checked, and the filters that decide which list you can see is operated by many volunteer editors. This helps in managing the quality of the data – since 2002 they had 300K users, 250mil observations – 98.5% world’s species. Because the checklist is smart, it is telling us if we recorded everything that you’ve seen or not, this provided the data for statisticians that can do the STEM model for distribution of species. They can see the routes of travel and discover routes of migration – e.g. over the ocean – which was not known to ornithologists before the data was available. Lots of papers are coming out, including about climate change impact. There is also analysis to support the location of creating wetlands to support migratory birds. The data is open and allow people to use it for many purposes. There are also survey of people who use the data – from law and policy, habitat protection and site and habitat management. There is evidence for effective conservation. The eBird data is used for the state of bird population and ways of exploring the data – it is being used for education with a range of lesson plans. There is also an effort to increase cultural diversity of participants. CLO was one of the first organisations that include citizen science in its mission. This links to the history of the lab that was always working with volunteers observers, since it was founded by Arthur Allen. Here it gets personal: Rick’s dad encourage him to be interested in birds and the environment, and he done analysis of Christmas Bird Count – he done diary of birds, and he managed to discover things that other people didn’t know. He joined the lab in 1972, and that led to analysis of Christmas Bird Count. After graduation he worked as Volkswagen mechanic and other jobs, and started working on the Living Bird magazine and found many things about the nest watch study. They started noticing impacts on citizen science. They developed different programme – e.g. FeederWatch that allow people to learn about the birds in addition to the data collection. So they have developed programmes – from Nest Record Card in 1965 to eBird in 2002. Citizen Science allow to track infectious disease, understand forest fragmentation impact that led to guides to forest manager. There were many other people doing work with citizen science – the number of peer review publications are appearing. Theobald et al. 2015 show that citizen science is contributing to many areas – many people, high financial value, and many peer review paper. The important aspects are: design and evaluate effectively, ‘own’ citizen science, diversity and inclusion and collaborate. there are different guides for citizen science and tool-kits. There are different terms that are being used – civic science, volunteer monitoring, traditional knowledge – but the concept is being recognised and it get traction – we need to own and embrace the term. Without a common term, it is impossible to quantify the impacts. The third point is diversity & inclusion – many community know things that we don’t know. The is an importance in collaboration – Finn Danielsen 2013 show that many indicators for international treaties can be done through citizen science. Rick hope to develop an eFish project next. 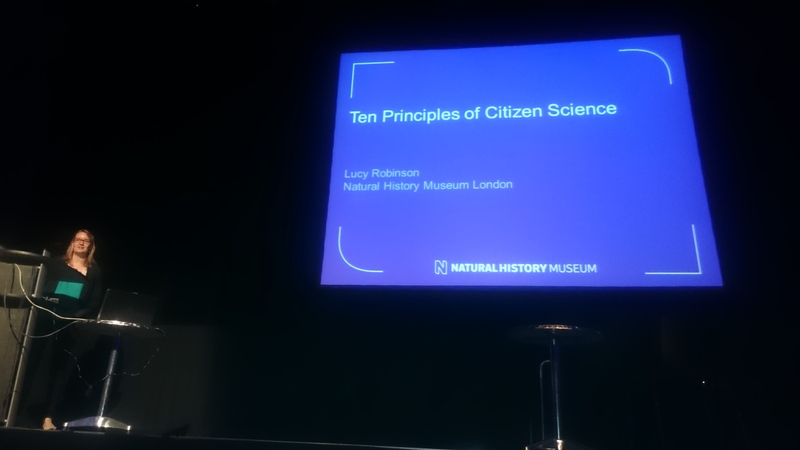 10 Principles of Citizen Science (Lucy Robinson – The Natural History Museum London, UK). The term Citizen Science was not used in the UK in the past but gain acceptance – she described the Natural History Museum, and through the Open Air Laboratories (OPAL) programme they secured commitments from management and it is central to their work. They have different project through different means – about 10 projects. The ECSA working group on best practice have developed the 10 principles which was an internal deliberative process. We were able to create them, and share them. Why are they needed? the term citizen science became a buzz word, and it create many opportunities, but also require challenges to agree on common concept and not use ‘we should’ – we don’t want standards – we want it as a flexible concepts which can be applied in diverse situations and disciplines – but we do want to have good practice. The principles are for inspiration, support, principle of good practice. She then gone through the 10 principles: The first principle is actively involve citizens, and there are many photos of people involve locally and the principle usually met. Second, we want to have real science, as Rick demonstrated – many peer reviews publications, but this is not the only output: from identifying pollution and acting on it, or other similar things. Third, thinking about who benefits – need to be mutually beneficial. Many benefits are varies and different between actors – we need to evaluate these impacts – but this is squeezed many times. 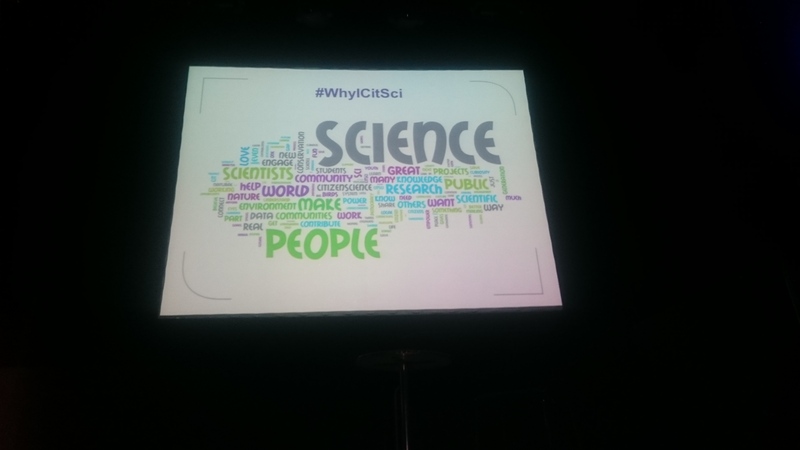 The #WhyICitSci during the Citizen Science Association conference in 2015 demonstrated the benefits for practitioners. 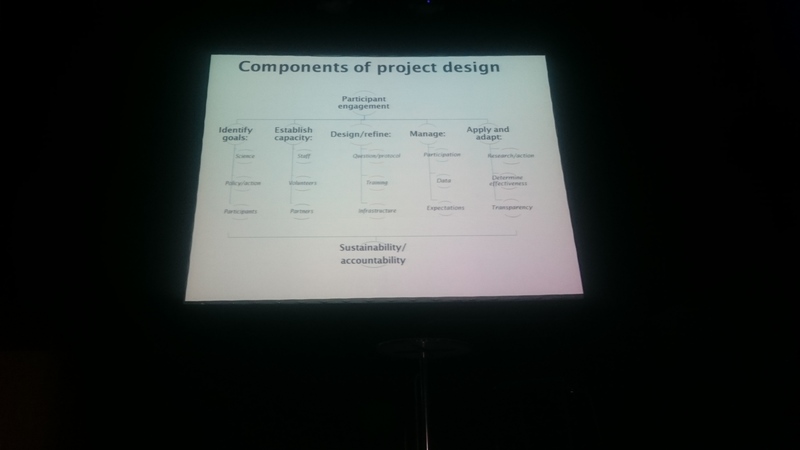 Four, there are smaller scale projects that allow people to engage in multiple stages of the process if they wish to. Fifth, we need to ensure feedback – it’s motivate people, feedback can be newsletter, maps, emails but personalised feedback is important – and can we be more creative. For example in LA they carry out meetups. Sixth, it is about understanding it as a research approach, and the data quality issue of citizen science is addressed – are we do in it enough to address the concerns. Need to remember that it is a research method. We don’t need perfect – high-quality data. We also need it fit for purpose. Seventh, need to make data and metadata open – in practice, this doesn’t happen for many reasons. Eights – we need to acknowledge the citizen science in project results and publications – in one case a project listed 37,000 co-authors (with only 10 professional scientists). Ninth, evaluating citizen science for their outcomes – this is something that can be squeezed out – evaluation require careful thinking what was the purpose of the project. Need to think in advanced about what success mean. Finally, considering ethical and legal considerations of the activity. The principles are translated to many languages – in 17 languages and 3 more in preparation. There are now news guides for citizen science. We are now an international committee – we have 300 people in the room who are presenting thousands of citizen science projects. What should be the eleventh principle? My talk, Participatory Citizen Science, is available in a separate blog post. 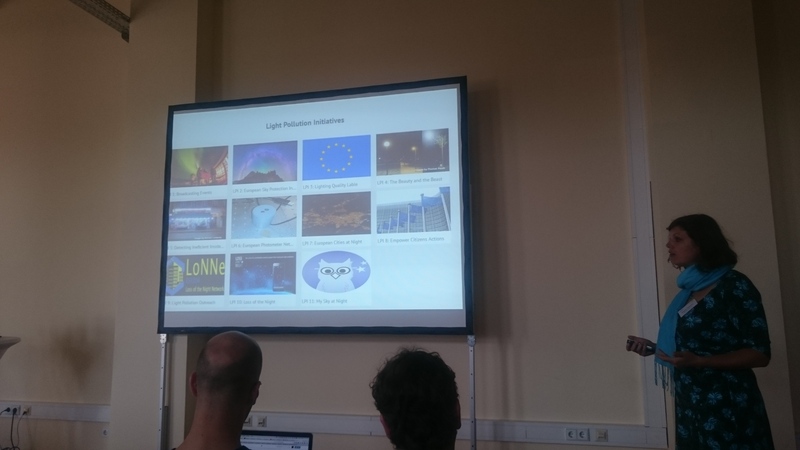 Worldwide citizen science initiatives on light pollution – organised by Franz Hölker & Sibylle Schroer (IGB Berlin, Germany )- usually, life for millions of years was dark, but humans started to illuminate the night, and many species are not ready for it. There are good reasons for the lighting of the night but aalso problems. The area of research into light pollution is an interdisciplinary area, and we need to explore it from different perspectives. How reliable is data produced by citizen scientists? (Chris Kyba – GFZ Potsdam, Germany). Chris discussed reliability – scientists are specific about calibration and acceptance of tools – e.g. Sky Quality Meter is called ‘Kindergarten toy’. Citizen science is ‘gimmick’ to get proposals funded – but that is not true any more. The disappearance of stars in the sky you can tell how much light there is. We are daytime active animals – satellite are no sensitive to blue light from LEDs, so satellites can’t capture all lights. The Globe at Night is being used around the world, and there is a paper Kyba et al. (Sci Rep 2013) – there is good correlation, but data is broad. The app guide you to look at specific area of the Sky – there is relationship between number of observations and the agreement with the data – more observations make people more confident. Data is quantitative and there is a method to check for accuracy. There are environmental variability (humidity, dust) there is also shot-to-shot variation and person-to-person variation. Trying to solve it through community experiments, and flashmob for science, and do repeated observation one after the other. With MyGeoss, they created a portal to give it to scientists and allow people to understand trend analysis from different projects. From an interdisciplinary science community to citizen science (Sibylle Schroer IGB Berlin, Germany). She looked at Carbon Sinks – ocean, forests and crop-land – there are impacts from cows and animals. There are significant impacts from agriculture – but what about lakes, light and GHG? Inland waters are active in global C cycle – one fifth of emissions are coming from inland water. There are anthropogenic drivers that increase temperature, carbon input, nutrients – but what about night-light? They done lab experiment and the artificial light at night influence Diatoms – shift in metabolism. This allow to calculate the impact of the 2.4% land area in Germany that covered by water – outside the lab what is going on. So the only way to do it is through citizen science, and evaluate the impact of artificial light – impact of village of agriculture activities – very complex package. Creating sampling package and options of recording by app or questionnaire, and then send it off. Crime Scene German Inland Waters: On the Track of CO2 K(atja Felsmann IGB Berlin, Germany). River areas are important as explained in the previous talk. There was a specific COST Action LoNNe which run 2012 – 2016.She was involved in research that took information from 635 sites – 192 streams, 609 questionnaire about night-time. Satellite data is only about light that go upward, not the blue spectrum. There are very good observations – with qualitative comments that help to understand the impact of light situation. At the COST Action ES1204 include people from many areas – there is a small community from in stars4all they try to reach out to many more people – citizen sensing and gamification – there are many initiatives and the question is about creating self-sustained networks and challenges of communication. World Café: 1 round of discussion instead of moving between tables. There are three hosts: potential and limits of CS for research; skills needed to create self-sustainable platform. – EU project STARS4All is relevant here. The idea is to sustained the network over time. Maybe similar lessons from Moon watch project in the 1950s. In the water project, participants that they will give them information about the water quality, they didn’t realise that it is about what the researcher learn. Another reason for success is a very good communication – the reason for continuing funding is not the good science, but because of the science – log with owl. Misconception of getting the data – is local impact. Motivation – in Alzheimer research UK they had a very successful game, but need to understand motivation of doing a game for the game, or is it about the motivation to help science. There are ways to encourage people to do more through competition but should be careful about the unintended competition. Interest in the results and personal aspects – need to identity. In Galaxy Zoo – this can be even volunteers that help other volunteers. There is scalability challenge of dealing with more and more volunteers. The most important words : motivations , cooperation. In terms of quality – is to improve it from the start through training. Selecting people according to skills – send people as control to try to see if you get bias. There are issues of funding to get project going over time. Having a lecture, and then do the activity.